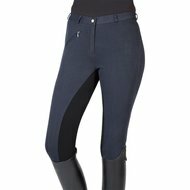 These breeches are made from an elasticated cotton-elastane fibre mix with a washable, synthetic leather full seat, sturdy belt loops, a zipper pocket and elasticated ankles: washable up to 30C. :Material: 95% cotton, 5% elastane: seat: outer side: 100% polyurethane, inner side 100% cotton: ankles: 90% polyester, 10% elastane. 92% would buy this product again. Good quality trousers for a reasonable price. Fit was perfect. Is worn 2 to 3 times a week. Very nice, fits well, fine fabric, good grip only the only drawback is the seat the fabric of the seat makes a kind of noise when you walk. Simple but fine riding breeches. The stretch fabric is very nice, the reinforced part somewhat stiff. But also a good pair of pants. Nice pants that are great for a good price. The pants look neat and comfortable. The fully reinforced seat does its job well. The pants remain beautiful for a long time, even after frequent washing and a lot of use. 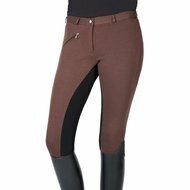 beautiful breeches with nice commitment. Is good and recommended for this price. 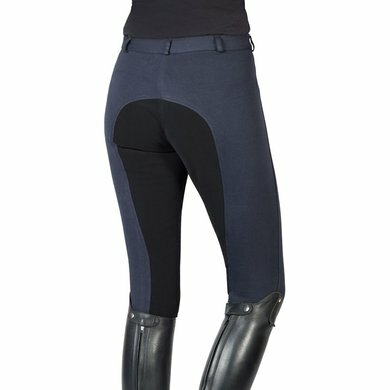 Question: is the trimming of breeches elastic ?. Answer: The pants are made of elastic cotton-spandex fibers and also has an elastic leg end.